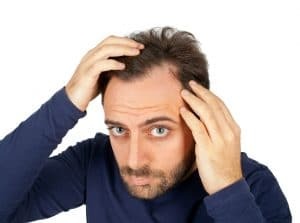 A receding hairline is often the marker of age in males, so it comes as no surprise that knowing how to stop a receding hairline is a common question. While a receding hairline is usually a result of age, it doesn’t have to be a reality. Too many people assume that it’s impossible to fix or stop a receding hairline, but that simply isn’t the case. At Advanced Hair Studio, we’ve been working to fix hairlines for over 40-years, and during that time we’ve helped over 500,000 people around the world. What Causes a Receding Hairline? Many factors can cause or speed up receding, but genetics is the most common cause. A receding hairline is usually tied to a hereditary trait, as increased sensitivity to male hairlines that affect the follicles is passed down through the generations. Many men will also find that they begin to recede at a similar time to other family members. Hormonal changes are also a common cause. During menopause, women can experience increased levels of hair loss, although this rarely affects the hairline. Traction alopecia, which is caused by wearing tight hairstyles (ponytails, dreadlocks) or wearing hats and helmets a lot. If you’re worried about your hairline, and you feel it is receding right in front of your eyes, you need to organise a free, no obligation Hair Check as soon as possible. This will allow us to determine the cause and progression of your receding hair so that we can devise the best treatment plan. Strand-by-Strand®: By matching new strands of hair to existing strands of hair, we can restore your hairline in a completely natural way. You can style it however you like, and no one will know that you’ve had treatment. Advanced Laser Therapy: By combining our Stem Cell Hair Technology Factors treatment with Advanced Laser Therapy, we have been able to increase hairline hair growth by over 90%! Advanced Singular Hair Grafting: This is our most dedicated treatment for how to fix a hairline. The procedure looks so natural that you can style it however you like, and there’ll be no evidence of the therapy. Advanced Laser Therapy: We often use targeted laser therapy to help address receding hairlines in women, and we have a 90% success rate. The laser creates the perfect environment for growing hair, meaning we can help to increase the growth rate in your hairline. Strand-by-Strand®: Just like the therapy for men, we match each strand to existing strands for the perfect method of hair restoration. The result is so healthy and natural that it can be styled however you like. With over 45-years’ experience and 500,000 happy clients around the world, we know how to fix your hairline. Once you begin treatment with us, you‘ll never look back, because you’ll be in control of your appearance and your future.